Multi-network cable tester is specified to quickly test by auto scanning the wires continuity, miss-wiring and polarization in your network cables, thin Ethernet (BNC)/10 Base-T (UTP/STP)/356A/ TIA-568A/TIA-568B/Token Ring..
By using the attached remote terminator, you can easily test the cable whatever before or after the cables installed.. It also allows you to test the ground of shielded twisted pairs cables..
Proskit 3PK-NT007N Multi-Network Cable Tester is a premium quality Cable Trackers from Proskit. Moglix is a well-known ecommerce platform for qualitative range of Cable Trackers. 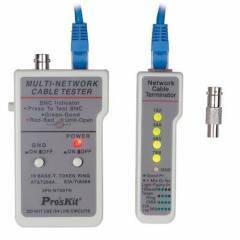 All Proskit 3PK-NT007N Multi-Network Cable Tester are manufactured by using quality assured material and advanced techniques, which make them up to the standard in this highly challenging field. The materials utilized to manufacture Proskit 3PK-NT007N Multi-Network Cable Tester, are sourced from the most reliable and official Cable Trackers vendors, chosen after performing detailed market surveys. Thus, Proskit products are widely acknowledged in the market for their high quality. We are dedicatedly involved in providing an excellent quality array of Proskit Cable Trackers.